I left Second Life early this evening. 2010 has been the happiest year in my second life by far, but my man is away with his human in the real world snow skiing this weekend. I was planning to do the Happy New Year at The Distillery but it wouldn’t feel quite right without my man, so I’m happy to just write this last blog post for the year. Happy New Year everyone in my second life, you’ve made the world where I found great happiness. And you can believe me when I say that wonderful things can happen even when you aren’t looking for them… you just have to be the best person you can be. Dancin’ and prancin’ as 2010 ticks down. 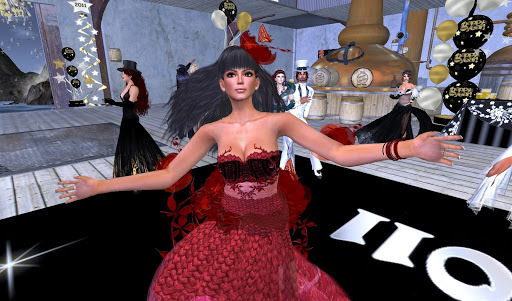 This entry was posted in Journal and tagged Holidays, Second Life. Bookmark the permalink. awwww…..i wished you would have stayed to see the new year in…..not that I would have kissed you. heheI enjoyed running around the day with you. I know you was missing your man. He'll be home soonHugs,Happy New Year!! !